The life of Sacred Heart Retreat, commonly known as “the monastery,” has changed along with the lives of the men who have lived here and Holy Cross Province of which it is a part. But, the story of the monastery reflects the history of Holy Cross Province. 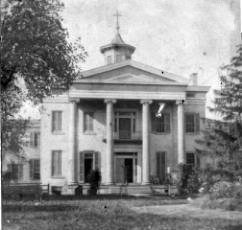 When the first Passionists arrived in 1879, they lived and served at St. Cecilia’s Parish in the west end and soon took up residence in the antebellum mansion on our present property. This house soon proved to be too small and the monastery was built and opened in 1905. The four columns from the mansion were repositioned at the portico of the new building: a symbol that the roots of the past would lead us in shaping the future. Within the year, the western portion of St. Paul of the Cross Province would become Holy Cross Province. We Passionists love to tell stories about our formation years. The Louisville monastery has been representative of our Passionist formation throughout its long life. Over the course of its life, the monastery has been home to vowed Passionists, novices, theology students, philosophy students, and visitors from all over the world. 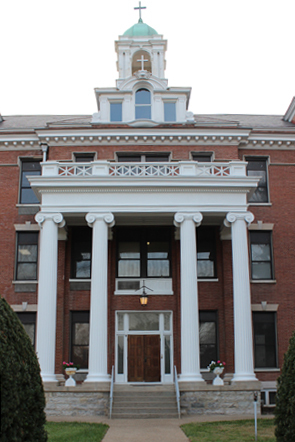 In light of the necessary repairs to the monastery after a devastating tornado on April 3, 1974, the declining numbers of students in residence and the need to better accommodate an aging community, it was determined that the building needed considerable updating. After his tenure as pastor, local superior Fr. Kent Pieper, C.P., spearheaded a capital campaign to remodel the monastery. The 1982 renovations removed the two wings that extended from the back of the building. Interior renovations were done, including lowering the ceilings to save energy costs. At the rear of the building, an elevator with ground-level entrance improved accessibility. The Provincial Chapter of 2007 determined that we would cease providing our own skilled nursing care in Chicago and Sacred Heart Retreat would be renovated again to better serve the elder members of the province. When needed, skilled care would be available at Nazareth Home, next door. The first floor and public areas on the second floor underwent extensive restoration to make the monastery more elder-friendly. Hand rails were installed on all three floors while the private bathrooms in each bedroom were redone. On the first floor, the original hardwood floors were restored and the ceiling returned to its original height. The former kitchen, dining and chapel area was completely redone to provide a larger pantry, kitchen, dining room and conference room. A new back porch was added with a section of it being screened in. Since reopening for occupancy in 2009, Sacred Heart Retreat has received several grants to help make living here comfortable for aging religious. Some examples of how these funds have been used: improvement to the exterior elevator vestibule for wheelchair accessibility; the purchase of senior-friendly leather furniture for the community recreation room; and most recently, new beds with remote controlled adjustments to improve sleeping comfort. Recent repairs have ended pesky leaks that dated back years. A major gift also provided for sealing the joints in the concrete front porch. A campaign in the Fall of 2016 allowed for the replacement of the southern-most column at the front entrance and the repair of the rotting porch roof. The painting of the entire front porch,including the four columns, has completed the project, restoring our “Ol’ Kentucky Home” to its stately appearance. Like the individual religious who have resided here, Sacred Heart Retreat has adapted to the needs of its various chapters of life in service to the mission of Holy Cross Province. Through our commitment to honoring the past while responding positively to present challenges, Sacred Heart Retreat is set to well serve those who live here in their retirement, and all who call this monastery home for many years to come. Error: Error validating access token: Session has expired on Monday, 18-Mar-19 14:16:37 PDT. The current time is Thursday, 18-Apr-19 17:41:18 PDT.